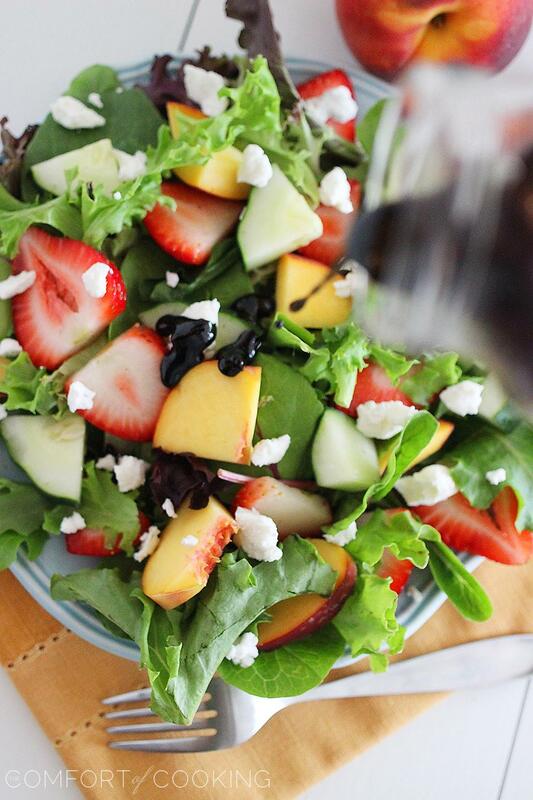 Sink a fork into this summery salad with fresh peaches, strawberries, cucumbers and goat cheese… crisp, salty & sweet! Now ain’t this just the most cheerful looking salad you ever did see? I’ve had a serious thing going on for fresh goat cheese lately, and I’ve been crumbling it on top of everything from pasta to grilled meats to crostini, and now, salad. What in the cheese-loving world was I ever missing! Hubby, however, is… skeptical but coming around. Let’s face it, the man will eat anything if I wrap it in salami. Paired with tender, sweet peaches, crisp cucumbers and juicy strawberries, goat cheese is just about my favorite thing in the world since the Real Housewives of New Jersey and all their drama and gold chains came back into my life. Oh, please. You watch it, too! Drizzled with a super-easy, sweet and tangy balsamic reduction, this gorgeous green salad is a great meal for getting your fill of vitamin C and iron! Replace the fruits with whatever you like if these ones aren’t your thing. Raspberries to substitute strawberries would be tasty, too. Cubes of fresh watermelon can push the peaches aside for an even more nutritious choice. So, see? If you have peaches and strawberries lying around, they don’t always need to be made into a buttery cobbler or a sugar-high pie! Try this scrumptious summer salad for your lunch or as a side with grilled chicken, pork or fish! It’s easy enough for weekdays but pretty enough for laidback dinner parties during the warmer months. I think it would be even better with a sprinkle of fresh basil. Pour a glass of crisp rosé or white wine and serve this salad with a soft loaf of garlic bread for a full dinner. You can replace the goat cheese with any other cheese you like, but you know me – I’d recommend going for the goat! Lay salad leaves out on individual serving plates and top equally with strawberries, peaches, cucumber and feta. Drizzle with balsamic reduction (recipe below), if desired. In a small saucepan over medium heat, whisk together balsamic vinegar and brown sugar until sugar has dissolved. Bring to a boil, reduce heat to low, and simmer until glaze is reduced by half, 15-20 minutes. Glaze should coat the back of a spoon. Let cool and pour into a jar with a lid. It is gorgeous!! I love fruit in salads and I am seriously consuming my weight in fruit this summer. Especially strawberries and peaches. So good!! Can’t wait to make this salad this weekend. I obviously have everything on hand! Cannot get over this. It is stunning! I’ve been looking for good salads to make when I cook meat on the grill. I love the strawberries in this! Goat cheese, balsamic reduction – LOVE IT ALL! I just posted a balsamic reduction type dish too – love that we’re on the same wavelength! Such a pretty and summer-y salad. I love goat cheese and fruit together, it’s absolutely wonderful. Thanks for sharing this with us Georgia. Have stellar weekend! Such a pretty salad, and I could literally drink the balsamic reduction alone, I love it that much! Truth – I can’t get enough of the Real Housewives of NJ. Double truth – watching it would be made infinitely better if I had a big bowl of this salad to eat. So in love with this. Gorgeous summer salad, Georgia! 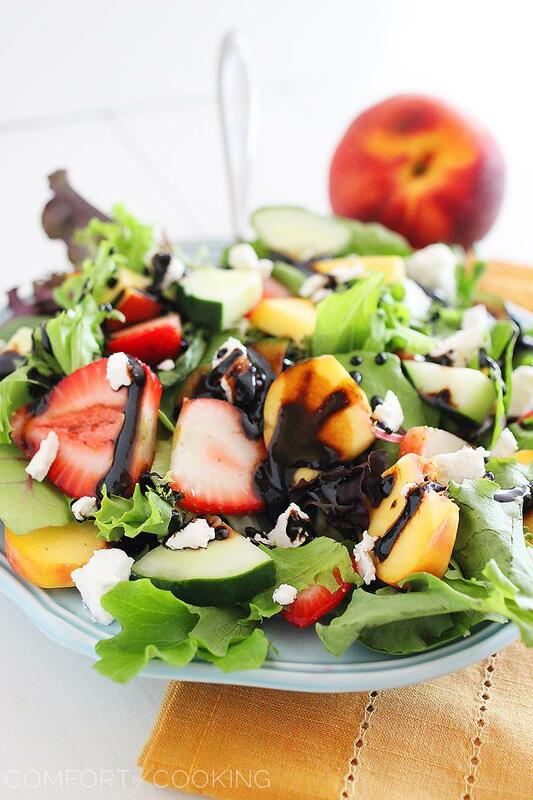 Love the fruit combination with the mixed greens and cucumber as well as the balsamic reduction. I’m craving salad now…right after breakfast! Mmm. Beautiful photos (as always)! And, bring on that feta! Thanks for sharing! This salad is so pretty – I love all the color! I just made something kinda similar and my husband was skeptical too at first (although didn’t complain one bit while he was eating it!). Have a great weekend Georgia! I love all the flavours in this summer salad! Simply beautiful! This is like summer in a bowl! Gorgeous colors and flavors, Georgia! What’s not to enjoy about this salad?! The balsamic reduction sounds lovely and so perfect for this. 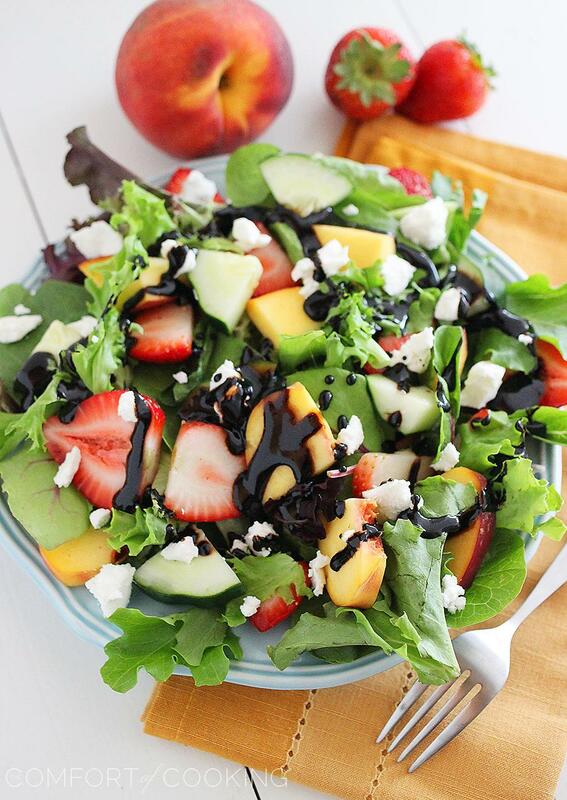 I’ve been loving adding balsamic to different fruits lately! I just have to try this salad! Goood lawd, if it were socially acceptable to bathe in that balsamic reduction, I probably would. This salad is summer personified! This is gorgeous! I mean it makes me want to dive right in with a fork and share nothing! Going to share on Facebook later today!!! I adore summer salads with fruits, and I’m a big goat cheese fan, too. This one looks so refreshing! That balsamic reduction sounds incredible! I am loving adding fruit to salads this summer, this looks so colorful and yummy! That balsamic reduction had me Georgia! I love summer fruits in salads so this is right up my alley! Everything always looks so vibrant and bright here. I have to try the balsamic reduction. Sounds like a great meal! this summer salad sounds incredible! i think it might even be better than my favorite strawberry poppyseed salad from panera! yum! Georgia, this salad is everything wonderful about summer (except ice cream, but that’s for another day). What lovely photos! This salad looks wonderful Georgia. Loaded with all kinds of flavors and so fresh – perfect for these super hot days when I don’t feel like cooking :) Have a great weekend! Oh yes, it is such a colorful and beautiful salad. There is definitely something about goat cheese, it is addicting. This looks refreshing and delicious, Georgia! All those colors and that balsamic reduction,,,this looks like one perfect salad. DYING over this salad! It is so gorgeous Georgia! Looks like the most amazing summer salad ever! Yes!! I’m so happy you posted this – it is exactly what I’m in the mood for during this oppressive summer heat (not t hat I’m complaining!) I love the light yet satisfy look of this salad, created with all things summer. Thanks for posting, Georgia, and have a wonderful summer weekend. What a lovely salad. I could eat this daily and never get tired of it and love the addition of strawberries and peaches in it. Beautiful photo and nice post. This looks so light and fresh and tasty; not to mention healthy! Yum! I love peaches in salad…and the whole combination of ingredients looks amazing! Perfect for summer!!! DELISH! Strawberry, peaches, and goat cheese? Yup, I’m on board! What a beautiful summer salad Gergia! i love everything about this and that balsamic reduction sounds incredible! Gorgeous colors and love the flavors! 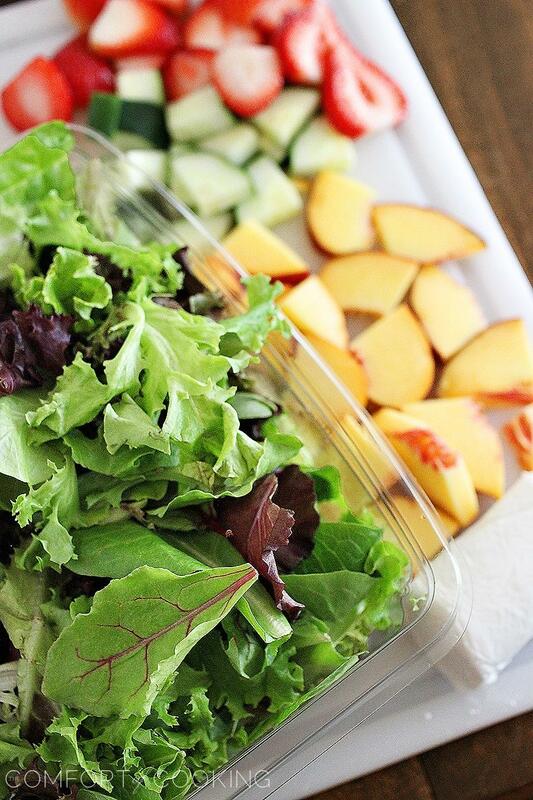 Peach season FINALLY arrived here in Michigan this week -this salad looks perfect!! That is one lovely salad. It’s got all the things I love and it’s beautiful! Yep, i watch it, too. And I love it. And I love this salad! I’m main lining goat cheese right now! So good! Wow what a lovely salad! I love the gorgeous fruit in it! Yummo – this salad looks delicious! I love, love, love fruit on my salads. I’ve actually never had goat cheese before though; I’ll have to give it a try. Ps. Love the brown sugar in the balsamic – I’m sure it’s great with that added sweetness! What a beautiful looking salad! I will be trying this soon! I think I’ll eat anything wrapped in salami, too. ;-) But no need to do that with goat cheese – I love the stuff just as it is. This is a seriously good looking salad – love the flavors you’ve put together. Good stuff – thanks. that salad is calling my name! it looks soo good. The best part though, is that glistening thick balsamic reduction! yummm!!! Beautiful salad Georgia! I saw it on Pinterest this morning and was smitten! Oh I love fresh goat cheese too! This salad is gorgeous Georgia!! There’s nothing I love more than fruit in salads. This looks light, fresh and perfect for summer, Georgia! Your food is always so attractive with all the beautiful colors and fresh ingredients! I want this salad everyday. All my favorite fruits in here too. :) Very pretty! 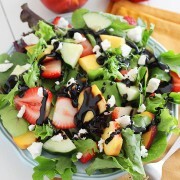 Mr. P is addicted to balsamic reduction… He drowns stuff in it.. Know he would go crazy with this salad! Beautiful combination! I love these flavors – sounds like a great salad! supply of top quality cheap cheap sports jerseys wholesale. I have been exploring for a little for any high quality articles or blog posts on this sort of area . Exploring in Yahoo I at last stumbled upon this website. Reading this information So i’m glad to exhibit that I’ve a very excellent uncanny feeling I discovered just what I needed. I most indubitably will make sure to do not fail to remember this site and give it a look on a constant basis.